Saturday at Tuska had the main stage reserved for more 'mellow' music - at least if you consider all the thrash and death from the first day. The opener was Epica, Dutch symphonic/progressive metal led by a very charismatic Simone Simons surrounded by long hair tall Dutch men. With a bunch of nice keyboards and guitar solos supporting Simone's melodic voice, the band was really loved by the people gathered early in the afternoon. It's also a nice show to watch as everyone has a great time on stage and I like the sight they create when the long haired stop in front of the metal cooling fans and start looking like Medusa impersonations. I went for a short while in the building hosting the 4th stage and was nicely surprised by the intensity of Medeia's brutal death metal. The Finnish band nicely combines beautiful keyboards and female backing vocals with powerful growls full of hate and rage. I only watched very little of their show due the fact that it was way too hot in there and also I wanted to see a bit of Tarot. Marco Hietala (Nightwish)'s band was another fun show to watch. Marco was wearing a pink shirt and a biker helmet, one of the guitarists had these round colored glasses, a Muppet doll was hanging on the drums, so you would just start smiling from the second they entered the stage. They delivered 45 minutes of decent power metal, without too silly vocals, but saving silliness for crowd interaction and for having the keyboard played jump off the stage for the last song, sitting on the tall speakers, waving at the crowd and then high fiving with everyone in the front rows. Back on the main stage for darker and more solemn songs from the Swedes from Katatonia. I think that their show in plain daylight loses a bit of the mystery and the atmosphere that they have in their beautiful music. Even if the singer, Jonas Renkse, looks rather shy by hiding his face in his long hair and occasionally headbanging, the rest of the band entertained the crowd with their dynamism. As the band celebrates 20 years of existence they treated Tuska audience with hit after hit, being rewarded with many cheers and applauses. 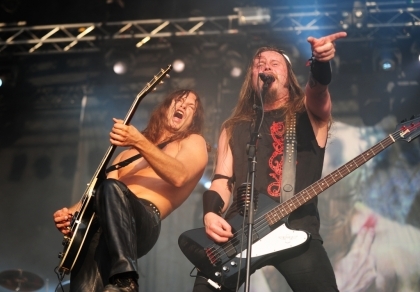 A blast of energy came up next on the second main stage, from the Finns from Wintersun and their extreme fast metal. A bit of irony in seeing Wintersun playing under the immense heat of Summersun, but besides that it was an impressive performance. Lots of technical skills displayed by the young guys, blending folk and progressive elements in their death like blasts. The drumming was so intense that I thought the guy would faint in the middle of the show. Unfortunately I had to run as I had an interview programmed and I couldn't watch the whole show. Even more unfortunate was the fact that the interview was canceled. My third Blind Guardian show this year. It always gives me goosebumps when everyone in the crowd sings along their famous tunes, especially Bard's song. It's cool to see that Hansi & co always enjoy being on stage and have a good time, but I didn't stay for more than the three songs during which we were allowed to take photos. It's not the kind of show to see so many times in a year though, plus I also think it was a high time for my body to demand food so I took advantage of the empty food area and tested a local hot dog. Nice stuff. A disadvantage of this festival is that the time when a band starts is actually the time when the previous one just ended, so sometimes it requires quite some rush to get tot he photo pit if you want to watch a previous show in a tent or so. And a second disadvantage was that they considered to put Ghost and Enslaved play at the same time. I decided to start with the Swedes from Ghost, who currently have only one album released which is quite non religious directed and with cool and catchy sounds. They had a long recorded intro during which every instrumentalist in the band entered the stage dressed in dark monks outfits and you couldn't even see their faces. The singer, on the other hand, was wearing this priest robe and 'hat', main difference being that all the crosses on it were upside down and his face looked quite demonic with the makeup he was wearing. A very ritualistic show, static as well, which I really hope to fully see one day. Luckily for me Enslaved was a bit delayed so I caught more of it than expected. I recently fully heard their latest release, Axioma Ethica Odini and fell in love with it, so I was thrilled to hear the tunes live. It was a teary moment when I realised that they were wearing black around their arms in memoriam of the events from Oslo. They played with great passion though and ended their setlist with 'The voices', a song they rarely played live lately, but they did it upon a request from a Finnish friend of theirs. That was a nice gesture. Saturday ended in style and with a lot of joy. Even if the performed two separate shows at Tuska last year, Devin Townsend managed to gather a really enthusiast crowd willing to see again his silly faces and funny backdrop projections with or without the Ziltoid. The nice surprise of the show was the appearance of Anneke van Giersbergen (The Gathering) whose voice is so awesome and the two of them together sounded really great when performing songs from albums such as Ki or Deconstruction. Despite the fact that Devin's faces and expressions seem to capture all of your attention, there's still time to notice that he actually is also a great musician and his music is of a rather complex nature. I totally understand the people who came to see him again as I would do the same. It was the kind of show to make you leave the festival area with a smile on your face and go on having a fantastic night with your friends, new or old.